Type: BARGAINS. Detail: Forbes, D. Product Code: 8071895563. 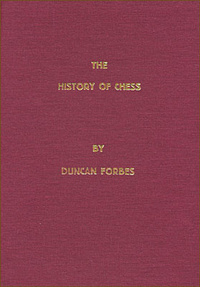 A reprint of the 1860 classic dealing with the history of the game from the time of the early invention of the game in India, until the period of its establishment in western and central Europe. Hardback.